The BJP President, Mr Venkaiah Naidu, today ruled out any move to advance or postpone Assembly and Lok Sabha elections, even as he asserted that clubbing of the two polls would be “ideal” for the country. Congress President Sonia Gandhi today held a meeting of the party’s Political Affairs Committee to decide the party’s response to the bills relating to a countrywide ban on cow slaughter and granting of full statehood to Delhi, likely to be introduced in the current session of Parliament. Visiting Ukrainian Foreign Minister Anatolyi Zlenko today revealed that his country had stopped supplying military equipment to Pakistan and expressed readiness to discuss stepping up of bilateral defence cooperation with India. The Supreme Court has ruled that the possession of secret documents by a person is sufficient proof for his conviction under the Officials Secrets Act (OSA) and set aside an order of the Delhi High Court acquitting a city businessman in the 20-year-old Larkin brothers spy case. It was a Rakhi celebration with a difference at Prime Minister Atal Bihari Vajpayee’s residence today. Why did Pak official spill beans on Kashmir issue? Uttar Pradesh Chief Minister Mayawati today tied rakhi on Urban Development Minister Lalji Tandon on the occasion of Raksha Bandhan. Veteran Bollywood star Shammi Kapoor, admitted to a city hospital here for severe lung infection, “is better but still in the intensive care unit (ICU),” family sources said here today. Shammi Kapoor, who was admitted last month to the Breach Candy hospital in south Mumbai as he had congestion in lungs and later developed renal problems, was responding well to the treatment, his wife Neila Kapoor said. Dabasmita, a neighbour of Kutubuddin Ansari, ties a rakhi on his wrist in Kolkata on Tuesday. Kutubuddin Ansari, a Gujarat riot victim, has shifted to Kolkata to forget the trauma he experienced during the riots. The Vishwa Hindu Parishad (VHP) today claimed that the archaeological excavations conducted during the past five months at Ayodhya conclusively prove that three temples existed one after another from the 7th century AD to the 12 century. It said the disputed structure was built after cutting pillar bases and the floor of the 12th century temple. The North Liberation Army (NLA) activists gunned down at least three tribesmen and injured seven at Kaspara village, under Dhamdaha sub-division in this district late last night. Petroleum Minister Ram Naik has ordered an independent inquiry into the aspects of safety and security of life in offshore operations. Tamil Nadu Chief Minister J. Jayalalitha has declined to attend the forthcoming two-day Inter-State Council meeting in Srinagar from August 27. Congress President Sonia Gandhi has accused the BJP of making concerted attempts to “mislead” the younger generation. The state Chief Minister, Mr N.D. Tewari, laid the foundation stone of state Haj House at Peeran Kaliyar, one of the holiest shrines of the Muslims in the country, 6 km from Roorkee, yesterday. The widows of 1984 riot victims will not celebrate Independence Day and will instead display black flags outside their houses in West Delhi as a mark of protest against the alleged inability of the Centre and the state government to provide them justice even after almost 20 years. The Railways has developed a self-propelled medical relief van for prompt rescue and relief operations in the event of train a mishap. A.S.Virdi claims to be the country's only painter to use "Anamorphosis". "Anamorphosis" was initiated by Leonardo Da Vinci in the 16th century. The nation celebrated the Raksha Bandhan festival with traditional fervour. 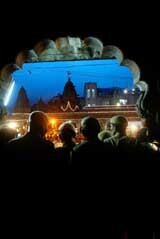 The mysterious Tantriks, who claim to possess spiritual powers, are a major source of attraction at the Nasik Kumbh Mela. Making an oblique attack on Chief Election Commissioner J.M. Lyngdoh, Mr Naidu said simultaneous elections took place in the country till 1967 during Jawaharlal Nehru’s regime. “There was ‘no cheating like hell’. Voting took place in a normal manner like in any normal democracy,” Mr Naidu said, asserting that there was no question of the BJP trying to force its view on the issue on other political parties. Replying to a question on the timing of the Lok Sabha poll, the BJP chief said, “There is no proposal for either postponing or advancing the Assembly and Lok Sabha elections”. Mr Naidu said the BJP had only put forward its suggestion before the nation for debate on having simultaneous elections. Mr Naidu said there could be no objection to holding simultaneous elections. “If the elections can’t be held in one day, it could be staggered over some period. Such elections would be in the national interest, save money for the exchequer and allow time for the administration to carry on development activities,” he said. On the Women’s Reservation Bill, Mr Naidu said he had written a letter to the leaders of all BJP allies, urging them to “seriously study” the BJP proposal for making 33 per cent Lok Sabha seats as double-member constituencies, with one of the two seats be mandatorily reserved for women in these constituencies, which would change on a rotational basis. He said this proposal, if accepted, would increase the total number of members in the Lok Sabha by 181 and the same approach could also be adopted in state legislatures. Mr Naidu said Finance Minister Jaswant Singh had assured that his ministry would look into the possibility of extending loans on cheaper interest rates to artisans, weavers and fishermen like in the case of farmers. “The Finance Minister has also assured me to explore the possibility of issuing credit cards to artisans, like the kisan credit cards for farmers,” Mr Naidu said. This assurance was given during a meeting Mr Naidu had with Prime Minister Atal Bihari Vajpayee in the presence of Deputy Prime Minister L.K. Advani and Mr Jaswant Singh today. The “informal meeting” of the Political Affairs Committee was preceded by an hour-long meeting of senior party leaders in the Rajya Sabha and Lok Sabha at the residence of Ms Gandhi. Sources said Mr Buta Singh, who heads the Public Accounts Committee, was also present at the meeting. The slew of promises made by the BJP leadership over the past two days, which have electoral ramifications, has forced the Congress to redraw its strategy inside and outside Parliament. With the government not in a mood to give in to the Congress demands over the impasse relating to the Public Accounts Committee report on defence purchases during the Kargil war, the Congress leaders today examined various options. There was a view that the government could agree to show the Central Vigilance Commission (CVC) report on defence purchases to the presiding officers of the two Houses, who could then decide if the report could be tabled. With the Congress continuing its “boycott” of Defence Minister George Fernandes, the party is unlikely to agree to a reply from him on the Public Accounts Committee issue. Significantly, the Congress has not yet come out with an official reaction to the proposed Bills on a countrywide ban on cow slaughter and granting of full statehood to Delhi. While the main Opposition party will not like to be seen opposing the Bill relating to a nationwide ban on cow slaughter, some Congress-ruled governments in the North-East have not passed such laws in their states. With Prime Minister Atal Bihari Vajpayee throwing the ball in the court of the Opposition on the issue of reservation for economically disadvantaged among the upper castes, the Congress is devising ways to not let the BJP gain an upper hand. Asked about India’s concerns on Ukraine giving armament to Pakistan, Mr Zlenko said it was being done earlier on business interests “corresponding to our national interests” but now the concentration was on trade and economic issues with that country. Talking to newspersons after his discussions with External Affairs Minister Yashwant Sinha, Mr Zlenko said, “We are not thinking in terms of politics when supplying armament to this or that country”. Asked whether Ukraine and India were working on any specific defence cooperation agreements, the Ukrainian minister, who also met Deputy Prime Minister L.K. Advani and Defence Minister George Fernandes, said “I am not competent to discuss in detail” the specifics, but added that “Ukraine is ready to discuss these issues” with India. The two foreign ministers signed four accords, including one on mutual protection of classified information and another on cooperation in the field of tourism. The two sides also signed agreements on instruments of ratification for a treaty on mutual legal assistance on criminal matters and promotion and protection of investments. 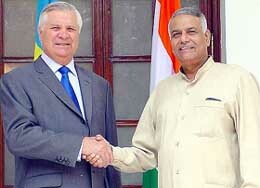 Mr Zlenko had yesterday told a business meet that Ukraine, could supply India many kinds of military hardware. Both sides shared the view that there was a need for new initiatives to boost trade and economic ties, he said. Mr Zlenka said President A.P.J. Abdul Kalam and Prime Minister Atal Bihari Vajpayee had been invited to visit Ukraine. As a part of ongoing high-level contacts, the Ukrainian Defence Minister will visit India in October and HRD Minister Murli Manohar Joshi will travel soon to that country. When solid proof was available against an accused about the possession of restricted documents that contained the names, number and field formations of the units of each individual officer... “and being important information from the defence point of view of the country, no further proof is required and his possession sufficiently substantiates that he or somebody on his behalf obtained or collected it for him,” the apex court said. “The mode of consideration and method of proof in a case like this, cannot be on the lines of a crime under the provisions of the Indian Penal Code,” it ruled. The High Court in its order of April 30, 2001, had upheld the sentence of 10 years’ rigorous imprisonment to retired Major-Gen F.D. Larkins (retd) and his brother Air Vice Marshal K.M. Larkins (retd), but acquitted Lieut-Col Jasbir Singh (retd) and Jaspal Singh. Though the apex court upheld the order of the Sessions Judge in respect of Jaspal’s conviction, but it modified the order of sentence by reducing it to one year, six months and 20 days, the jail term served by him while in judicial custody before being released on bail pending the appeal in the High Court. The apex court said only his sentence is modified while the imposition of fine would remain unaltered. The Sessions Court had found them guilty of possessing certain sensitive documents about the forward formation and movements of the Indian Army, which according to the prosecution, they were supplying to some western countries. The Delhi government had challenged the acquittal of Jaspal Singh and Lieut-Col Jasbir Singh (retd) in the Supreme Court. The latter died on February 26 this year while the appeal was pending before the apex court. The Larkins brothers are reportedly now staying in Australia. They had allegedly jumped the bail. In his 12-page reply, sent to all senior leaders of the BJP, including party President Venkaiah Naidu, the party incharge of the state and the BJP state President, the MLA has vowed to continue his agitation against the BSP to protect the Dalits in his constituency. “How could a Chief Minister from any public platform announce to arrest me only to punish for my effort to fight for the cause of a poor Dalit,” he said. Earlier, senior BJP leader and legislature party leader Lalji Tandon had maintained that the MLA had violated the party discipline and action had been taken for his anti-party activities. The cynosure of all eyes was Sandhya, who, on crutches, trudged to Mr Vajpayee and not only tied a rakhi to him but won his heart by singing a patriotic song “Pyara Bharat desh hamara, jhanda uncha rahe hamara”. 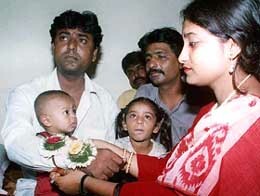 Sandhya and some other physically challenged children from the Society for Rehabilitation later posed with the Prime Minister for a photograph. 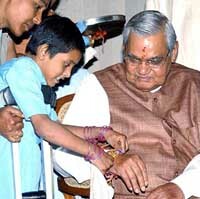 Children from different schools in and around New Delhi enjoyed every moment of the occasion by tying rakhis on the wrist of Mr Vajpayee who sat smiling throughout the function. The scene was festive. Dressed in her peach-coloured salwar kameez, Ms Mayawati drove down to Mr Tandon’s Chowk house with officials accompanying her. 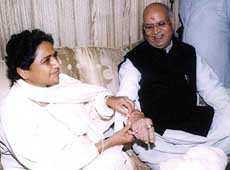 “I wish a long life for my brother and may he attain new heights in politics,” Ms Mayawati told reporters. Reporters asked Ms Mayawati whether Mr Tandon, as her elder brother, protected her government. The Chief Minister said Mr Tandon had protected her government in the past and would protect it in future also. The Archaeological Survey of India (ASI) excavations from March 5 to August 7 have unearthed 70 pillar bases and other artefacts linked with the temple which supports the findings of archaeologist B.B. Lal and the study conducted by the Tojo Vikas International, VHP working President Ashok Singhal told mediapersons here. The press conference, which Mr Singhal said was called to clear doubts raised by media reports that nothing connected with the temple was found during the excavations, was also attended by VHP Vice-President Giriraj Kishore, archaeologist Arun Kumar Sharma and Indian Archaeological Society Chairman Swaraj Prakash Gupta. Mr Gupta said more than 100 big pieces of the temple were found at the excavated site. Besides 70 pillar bases, other things found were ‘amlak’ (wheel on temple), three sculptures of ‘makar’ (crocodile), big stone pieces called ‘vallari’, which were typical of gateway of sanctum sanctorum, diamond-shaped stone pieces and lotus carved from stones. The North Liberation Army (NLA) activists gunned down at least three tribesmen and injured seven at Kaspara village, under Dhamdaha sub-division in this district late last night. The activists, belonging to the NLA’s Shanker Singh gang, also burnt down 10 houses of the tribesmen. The police said the cause of the killing was an old land dispute. Superintendent of Police A.K. Verma said here today that the NLA activists attacked the village under Dhamdaha subdivision and opened indiscriminate fire, killing three on the spot and injuring seven other. Mr Naik said an inquiry committee would be constituted which would look into the air logistics, maintenance, repairs and renovation of offshore structures and pipelines, hiring of helicopters, particularly from Mesco Airlines. The committee would also enquire into any omission and the role of management. Mr Naik said he had asked the CMD, ONGC, to formulate an emergency plan to strengthen safety measures for air transportation to offshore projects within a fortnight. He said the helicopter of Mesco Airlines was going from Sagar Kiran Rig to Sagar Jyoti of Neelam Field carrying 25 passengers, 22 from ONGC and three contractor employees and 4 crew members. After take-off at 12.15 pm, it crashed within 3 minutes. The twin-engined helicopter was having airworthiness certificate valid till March 30, 2004. While two passengers, both from ONGC had been saved so far three dead bodies had been recovered and the rescue work was still going on. A statutory investigation has been ordered by the Director-General Civil Aviation, into the crash, he added. Mr Naik said he rushed to Mumbai by the first available flight after hearing about the incident. Though no official reason for her not attending the crucial meeting had been given, but Ms Jayalalitha was reportedly apprehensive about the security situation in the state, sources indicated. Initially, the Tamil Nadu Administration had requested that a Tata Safari be made available during her stay in Srinagar. But when told that the Jammu and Kashmir Administration did not have the required vehicle and Tamil Nadu could make its own arrangements, she reportedly developed cold feet, the sources said. The meeting, which is being held after a gap of two and half years, is slated to discuss the remaining 17 recommendations of the Sarkaria Commission which are essentially related with Article 356 and 365 of the Constitution. The Haj House, to be set up at a cost of Rs 2.56 crore, is the seventh state Haj House in the country. The Haj Council of India will also contribute Rs 50 lakh towards its construction. Addressing the gathering, Mr Tewari said just as there was unity in diversity in the country, in the ‘dev bhoomi’ of Uttaranchal also different religions co-existed peacefully. The inaugural ceremony was presided over by the state Minister for Social Welfare, Mr. R.P. Tamta. “Independence Day is not for us.... It is for the killers of our husbands who are roaming free on the streets,” said Darshan Kaur, president of the November 1984 Victim Widow Jatha. “We will boycott all Independence Day celebrations, official or unofficial, and also not watch Prime Minister Atal Bihari Vajpayee’s address from the Red Fort on television. Instead we will display black flags outside our houses in the widows’ colony in Tilak Vihar,” she said. The van has a power car coach and a medical coach. The power car coach has been equipped with propulsion based on diesel engine and a hydraulic transmission unit for quick acceleration. It has a speed of 100 kmph. It has also been equipped with a hydraulic metal cutter and tools for cutting window bars. A diesel generator set fitted on the van can provide air-conditioning for three or four days.